"Jeff Roland creates bold, colourful pieces which reflect a constant desire to explore the human psyche. Born in France in 1969, he has sold works to collectors in France, Switzerland, the Netherlands, the UK, the USA, Norway, Canada ,Italy , etc, and his work is part of the London Museum of Everything Collection and the Barcelona Davis Museum collection . Jeff Roland believes that his art, which emerges from the subconscious, should not be defined according to the expectations of the modern art world. Instead, it is a personal interaction between artist, canvas and viewer. 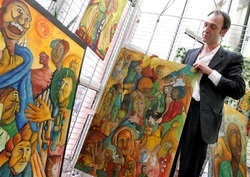 A self-taught painter, Roland's work is characterised by his use of distinctive,tribal-like figures, a juxtaposition of opposing symbols and flattened backgrounds. His paintings fuse aspects of the raw style with contemporary literary and visual references. A number of key themes can be idenfied in Roland's paintings. 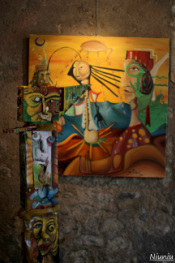 These include belonging (as an artist and individual), interconnectedness and conformity. He is also fascinated by the creation of history. The consumption of one society by another appears repeatedly in his body of works.Roland's paintings stress that "civilization" is built on the fragments of older, arguably more primitive societies. This is used as a psychological metaphor where civilization acts as the rational conscious usurping the place of the more primitive subconscious thought. The subconscious/conscious struggle depicted throughout Roland's work highlights another core aspect of his paintings. He constantly explores dualism and the individual's attempt to define his place within a world of opposing forces. The polarities embedded in his paintings take many forms and include light and dark, ignorance and knowledge, the invidual and the society, and the historical past (and its construction) and the present. His juxtaposition of primitive symbols- such as snakes and neolithic style figures - and contemporary symbols (including pop culture rabbits) - are a prominent example of this concern. These opposites, which affect both the artist and viewer, signify the constant pull of the conscious and subconscious on the individual.Jeff Roland's paintings are not limited to a dualistic world view. The artist firmly believes that between the two most extreme points there are many universes and infinite possibilities. As such, his works record the fluid transition from one state of being to another. EXPOSITION | ANCIENNE VERRIÈRE SAINTS-PIERRE ET PAULLe regard amusé de Jeff Roland sur la face cachée des chosesRetour aux sources, tel est le nom de l’exposition de Jeff Roland, qui présente une vingtaine de toiles à l’ancienne verrière Saints-Pierre et Paul. Un clin d’œil à son grand-père originaire de Cottendorff.Retour aux sources, tel est le nom de l’exposition de Jeff Roland, qui présente une vingtaine de toiles à l’ancienne verrière Saints-Pierre et Paul. Un clin d’œil à son grand-père originaire de Cottendorff. Nothing is fixed in his paintings, nor explained. Enigmatic entanglements of faces, hands living on their own and. ..the Rabbit . ​The ochred sulphur, the warm blues, the reddish greens cannot help the human, lost in uncertainties and multiple universes. This disturbing artefact of childhood is fighting complacency and naivety , by imposing itself in a world of adults who are lost in odd truths. Without a look at each other, everyone assumes his loneliness in an abysmal universe of constellated colours. (M. Ferreras) Symbolism full of signs, through "private universes" of primarily Transvanguard inspiration ... Born in Longeville-les-Metz (France), and today a resident of the City of Liverdun (with its castle and aspect of the Loire river valley), with expos in France, Rome, Britain ..., has a very personal imagery of magical surrealism, with hints of ethnic spirituality, primitivism, and so unique ...! : Mixed Stroke-traits for magical expression, from lyrical abstraction to "Brut" coloring, with oniric inspirations, fantastic, sometimes medieval (Romanesque ... brought to the century! ), and in which case are distorted icons in the current era: streets, types, muralist, drama ... in a performance overflowing with nostalgia in search of hidden pictorial meaning, interlaced with postmodernism ... "and that leads him to his special" distortion "of the universe ... More, He has chosen muses, the most important ones being the Russian model Irina, and an American photographer named Elizabeth who are reinterpreted in an inspired way, repeatedly. 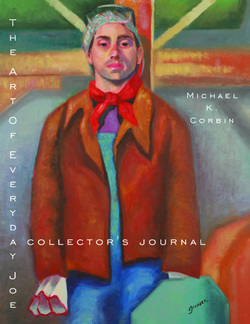 You absolutely need to check out the artbookguy.com website, read the insightful articles, interviews, and more .